I kinda knew I'd find Champagne in paradise. I just momentarily forgot it was so easy to find my way back to Paradise. This month, "everyone who walks in the door," says Paradise Ridge tasting-room manager Annette McDonnell, "I hand them a glass of bubbly." Whether sampled from a flute or a bowl, the Paradise Ridge 2014 Blanc de Blancs ($44) warms the nose with aromas of brioche and toasty lemon merengue pie crust, before awakening the palate with a broad sweep of brisk, lemony acidity. McDonnell and her personable staff like to interject a little wine education even while pouring a glass of sparkling wine—partly for their own amusement, jokes a staff member, because it involves trying to sip while holding one's nose. But wait—why am I still talking about Paradise Ridge, the Santa Rosa winery we mourned as "lost" and "gone" after the Tubbs fire left it in a smoking (and highly televised) ruin? Indeed, for this column, I'd originally intended to find some orphan bottle of the estate's wine, wax sentimental and tactfully ask how grieving fans might help—or just find the wine. That's when I remembered that back in 2008, Paradise Ridge opened a satellite tasting room in a cozy little shack on Highway 12. "And the view is beautiful," says McDonnell, gesturing out a front door that frames a Sugarloaf Ridge–area landscape that's dramatic on any day—just somewhat charred at present, by yet another fire that had also threatened the little town of Kenwood in the direction of the back door. What a month! But McDonnell says she doesn't want the winery's story to stick on scenes wrought by the fires: "We don't want people to be 'Aww.' We want people to be 'Yeah!'" 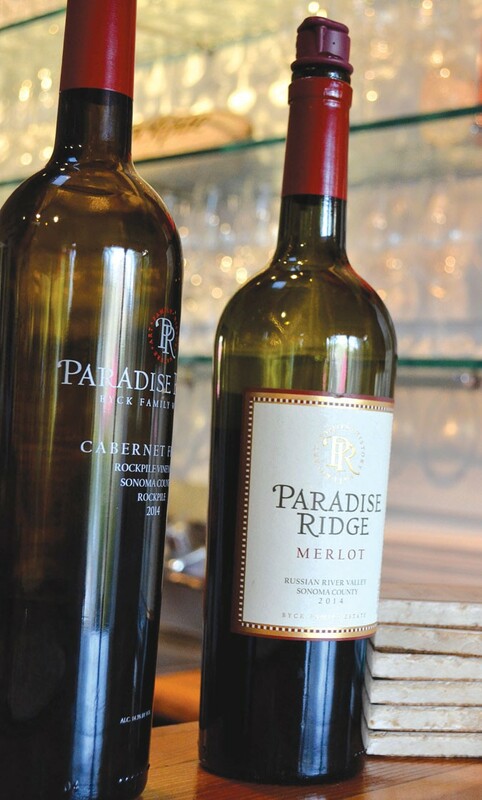 The best way to help Paradise Ridge, she says, is to help their wine country neighbors by visiting and buying wine. Not that they don't have plenty of their own to offer, having 11,000 cases in safe storage at a Windsor facility. It's been mostly locals here in recent weeks, says McDonnell, although today she's hosting two couples who trekked up from the East Bay, having got a tip that the winery was still open in Kenwood. After tasting through wines like the luxuriously silky 2015 Nagasawa Vineyard Russian River Valley Chardonnay ($40), which defies simplistic California Chardonnay descriptors, and the 2013 Convict Rockpile Zinfandel ($48), a popular, plum-and-cassis-scented Zinfandel that evokes Cabernet, it looks like they're very much on the "Yeah!" side. Paradise Ridge Kenwood Tasting Room, 8860 Sonoma Hwy., Kenwood. Open daily, 11am–6pm. Tasting fees, $15–$20. Herb and chocolate pairings, $25–$40. 707.282.9020.